[Editor’s note: An exciting development as Chris Leger @ Earthrover Software has partnered with Tom Harrison to release several of Tom’s California-focused recreation maps the iPhone and iPod Touch, the first such for the platform. Other efforts have wrapped poor functionality around terrible maps and in a couple cases decent gov’t National Park Service maps, not original custom cartography. Chris was kind enough to give me an email interview about the product. As hand held GPS units, mobile platforms like the Apple iPhone and Amazon Kindle all converge, delivering custom maps to these devices will become a more important business opportunity for cartography shops. I see two classes of mobile map applications: (a) raw map with GPS and (b) enhanced map with GPS. Earthrover’s maps are a good example of the former while PacMaps’s Acadia National Park map app shows how a flat map can be enchanced with a placename index to search locations on the map and possibly even routing information. So far examples of both solutions use just one map scale. It would be nice to see developers work with cartographers to offer additional custom maps at the zoomed out scales since the raw map isn’t legible when zoomed out. Who contacted who about developing this app oriented around the recreation maps? I first saw your Mt. Tam Trail Map app ($5 each) and was entranced. Additional titles include: Angeles Front Country Trail Map, Mamoth High Country Trail Map, Point Reyes Trail Map, and San Diego Backcountry Trail Map. I contacted Tom [Harrison] about it, and he was willing to give it a try. 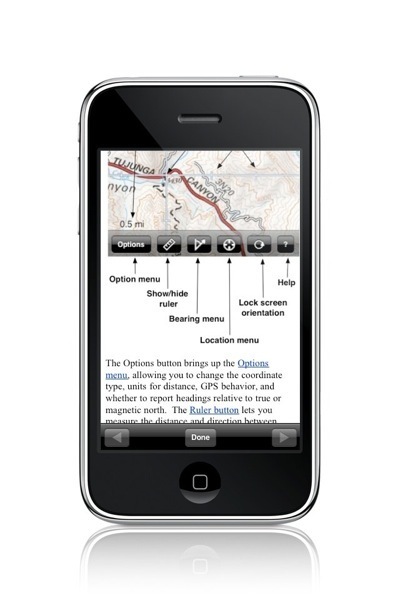 I’ve used his maps in the past for trips in California, and my main interest in writing iPhone apps is for field guides and reference information to take into the field. 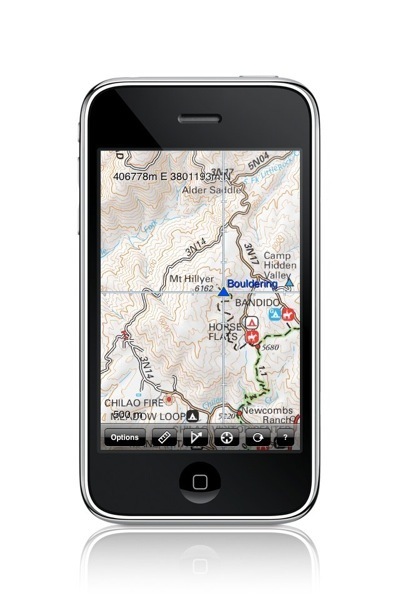 Having Tom’s maps available was one of the first things to come to mind–his maps are great and are well known, so they’re the obvious choice to have on a mobile device. I assume you did the development of the app? How much design review went into the app and it’s functionality? Right; I wrote and designed the app. I spent some time thinking about which features would be worth the complexity of implementing them, did some research to figure out what format to use for the data (PDF versus SVG versus PNG versus …), made a prototype to focus on smooth scrolling and zooming, then kept refining it until there wasn’t anything left on my to-do list. Since Tom’s underlying map data is of such high quality, I could focus on keeping the user interface fast and tight–there’s not much screen real estate to play with, so every button counts. What have your initial sales been like? With a few titles out and no advertising apart from our websites, I’d guess we’re averaging about 3-5 sales a day. This will go up as we add more titles, and hopefully there will be a broader audience for some of the upcoming maps of National Parks. While it would be nice to have a blockbuster project and pay off the mortgage, I don’t see that in the cards for the types of apps I enjoy writing–which is important since I’m doing this in my spare time, rather than on someone else’s dime. I’m more interested in expanding sales by taking the underlying engines I now have for maps and field guides, and applying them to more products to appeal to a broader audience. This has worked well for field guides. 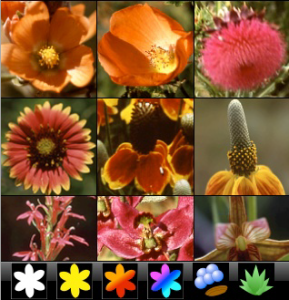 The second one, Wildflowers of the Western Plains, was released today, and five more are in the works. Do you anticipate future titles (you must be experiencing some success to keep coming out with titles)? Yes, we have more coming. I submitted the Yosemite Valley Trail Map to Apple today, and Sequoia/Kings Canyon, Yosmite National Park, Death Valley, and Tom’s complete John Muir Trail map set are in the works. How long did it take to develop the app? It was about a month of calendar time, I think, between me contacting Tom and getting the first app released. That doesn’t sound like much, but I’m a pretty efficient programmer and put in a lot of hours that month. What kind of testing have you done with it out in the field? I’m embarrassed to admit it, but I haven’t done any field testing with the apps yet. I don’t have an iPhone (just an iPod touch), so I can’t really check out the GPS functionality except via IP localization. Tom does field checks of his maps, so the underlying map data is known to be good, and I use Google Earth to fine-tune the map coordinates in the app. How do you see the iPhone 3.0 firmware making it easier to develop this type of product? Easier integration with Google Maps will be interesting for many apps, and an obvious update to our apps is to allow the user to switch back and forth with a Google Maps view. But Google Maps requires a network connection–ruling out use in the field on an iPod touch–and isn’t as fast in zooming and scrolling as our apps.